The Panasonic MC-CG917 OptiFlow is a vacuum cleaner that’s affordable, powerful and easy to use. In this review I’ll show you all the features and specifications of this Panasonic canister vacuum cleaner. Is Panasonic MC-CG917 OptiFlow canister vacuum cleaner the best affordable canister vacuum cleaner on the market? Is it the best rated canister vacuum cleaner in its class? Panasonic MC-CG917 represents everything you need when it comes to Panasonic vacuum cleaners. Panasonic MC-CG917 is light, small in size and distinctively designed. It comes in a combination of ebony and green, and runs quietly. This canister vacuum cleaner has a lot of positive customer reviews on amazon. 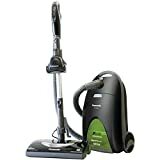 Many customer reviews on amazon state that Panasonic MC-CG917 OptiFlow canister vacuum cleaner has a balanced price to quality ratio. Furthermore, Panasonic MC-CG917 OptiFlow is among the best rated canister vacuum cleaners with 4 out of 5 stars. With lots of accessories that come with it, you can clean your house with ease. Panasonic MC-CG917 has a 14 inch wide power nozzle that allows a wide area of coverage. 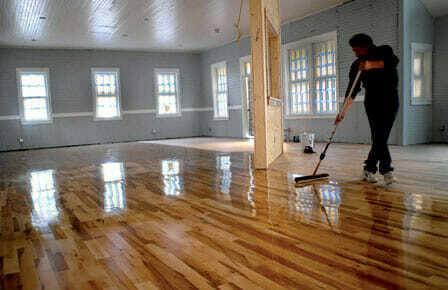 There is also a brush for bare floors and even for a deep carpet. Panasonic MC-CG917 OptiFlow runs on dual motor and uses OptiFlow technology to keep the airflow constantly strong. And all the dirt that gets sucked up, ends in a HEPA bag that has a decent capacity. Also the HEPA filters keep the nasty odors away. Panasonic MC-CG917 OptiFlow canister vacuum cleaner uses HEPA filters to help you clean all the pollutants, irritants, pet hair and much more from almost every surface in your house. One of the main features is the bag canister that Panasonic MC-CG917 vacuum cleaner uses. It helps you remove the dirt easy and safely. The bag is stored inside a caddy that has a handle so you can remove the bag from the vacuum cleaner and you don’t get dirty or spill anything on the floor that you are cleaning. OptiFlow technology provides constant airflow no matter how full is the bag canister. This means that even if the bag is full, Panasonic MC-CG917 vacuum cleaner is still cleaning your house with no change of suction intensity. Panasonic MC-CG917 comes with aluminum telescopic wand and an 8 foot hose that rotates up to 360 degrees. This helps you reach the corners of your house while you do your every day cleaning. Telescopic wand means that you can stretch it and get that extra length that you need. The handle is equipped with bare floor switch and the 14 inch wide power nozzle comes with overload protection reset. If you have problems cleaning multiple rooms, Panasonic MC-CG917 helps you do that with its 24 foot long power cord. A powerful 12 amp motor allows a great suction and makes cleaning of your home easy and quick. This means that you can easily clean all the dust, pet hair, and many other kinds of dirt at your home. Panasonic MC-CG917 canister vacuum cleaner is very light and small in size. 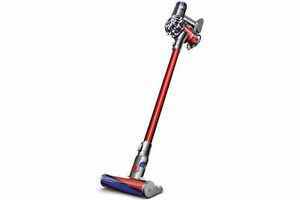 With its 12 inch length, 8.7 inch width and 21.5 inches in height, this vacuum cleaner weights only 12.3 lbs. Panasonic MC-CG917 OptiFlow canister vacuum cleaner comes with a limited one year warranty that includes parts and labor. During that period there will be no charge for parts and no charge for labor, if you respect the terms of warranty. So if you decide to buy this Panasonic vacuum cleaner read the warranty carefully. As any other vacuum cleaners on the market, Panasonic MC-CG917 OptiFlow canister vacuum cleaner has its good and the bad sides. Here is the list of pros and cons regarding this Panasonic canister vacuum cleaner. HEPA filter helps you remove most of the dirt you can find in your home and it’s great for pet hair cleaning. Bag caddy lets you safely take out the dirt when you’re done cleaning. Ergonomic handle for you comfort while you do the cleaning of your home.Various tools on board for different types of surfaces. Telescopic wand makes this Panasonic vacuum cleaner a handy tool when you want to reach those high places in your home. Powerful 12 amp motor offers a great suction. There is no bag full indicator on this Panasonic vacuum cleaner. This means that when you finish cleaning your house from dust, pet hair or any other dirt, you have to check when the bag is full. Although the bag is pretty large so there’s a lot of room for all of your pet hair in there. There is no stain removal option so you can’t clean the stains using this canister vacuum cleaner. Many reviews state that it starts to act out short after the warranty period passes. This is something you should keep in mind if you are looking to buy Panasonic vacuum cleaner like this one. To conclude this review of Panasonic MC-CG917 OptiFlow canister vacuum cleaner, it’s important to remember that the best way to really know it is to experience it. But until you do, we hope this review will give you a fine image of this vacuum cleaner. We know that when you buy Panasonic vacuum cleaner you get a vacuum cleaner with good user reviews. We know you get distinctive design, and numerous tools for specific use. The powerful dual motor combined with OptiFlow technology will satisfy your needs. It has all the power needed for that extra suction. So if you have pets, pet hairs are no longer a problem. If you have kids, you could get rid of those nasty irritants and keep kids safe when they play on the floor. So the key words for Panasonic MC-CG917 OptiFlow canister vacuum cleaner would be: Power, design, usability and affordability. Please, tell us in the comments about your experience with this vacuum cleaner. Is Panasonic MC-CG917 the best canister vacuum cleaner for you? How do you compare it to the best rated canister vacuum cleaner on the market?